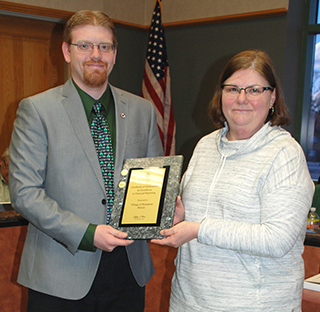 At the March 17 Village Board meeting, Trustee Marie Johanik-Guzzo thanked Finance Director Spencer Parker and the entire Finance Department for their excellent work. The Westmont Finance Department recently earned a Certificate of Achievement Excellence in Financial Reporting award. The Village first received this award for Fiscal Year 2004, and since that time has maintained its commitment to excellence in financial reporting and earning numerous awards. The Excellence in Financial Reporting award represents a significant achievement and reflects the Village’s commitment to meet the highest principles of governmental financial reporting. The GFOA’s Excellence in Financial Reporting award is the highest form of recognition in the area of Government accounting and financial reporting. Only about 12% of Illinois municipalities receive this award annually. Congratulations to Director Parker and the Finance Department.